With enhanced listings across the web and mobile apps, SinglePlatform makes sure you’re everywhere you need to be — making it quick and easy to get discovered by new customers in your area. From listing optimization and mobile site creation to social media scheduling and a comprehensive analytics suite, you’ll find the tools you need to get your most important information out across the web. SinglePlatform makes it easy to showcase and update your business’s most important information everywhere local consumers are making decisions online. 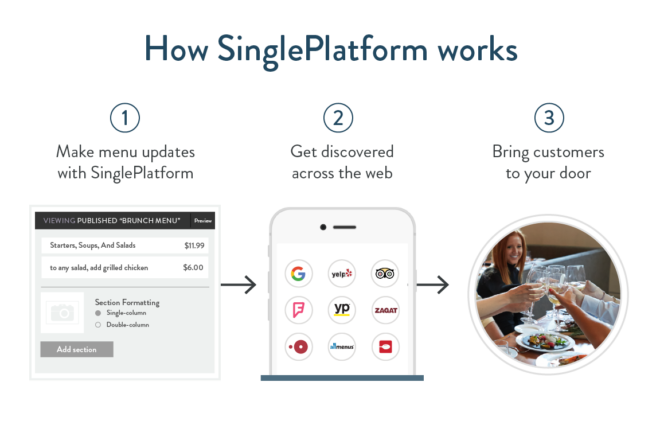 SinglePlatform is your connection to the top search engines, travel and review sites, online listing directories, and mobile apps used by over 200 million people to find local businesses. They’ve built the technology, partner network, and support team to drive local business success. 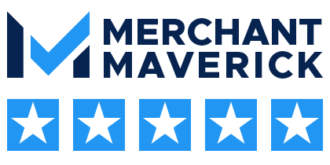 You’ll have a dedicated support team to ensure your business information is being displayed intuitively, accurately, and prominently across all channels of the internet. As every restaurant owner knows – it’s important that your potential diners are able to easily find your establishment, and the more information you have posted online, the more likely a customer will find what they need and patronize your establishment. So – it’s important to have consistent messaging, menus, hours, directions, and more about your restaurant posted everywhere a potential customer might search for it. 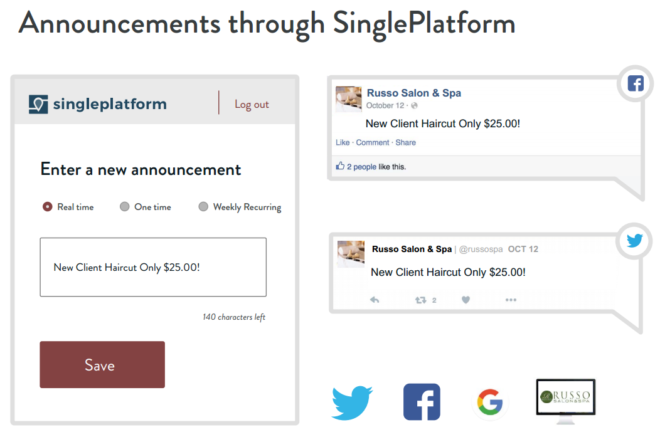 With SinglePlatform, it’s easy to generate new deals/announcements, and get them quickly posted to all of the popular social media channels. Ensure that any prospective customer who’s searching for your services sees what you have to offer! 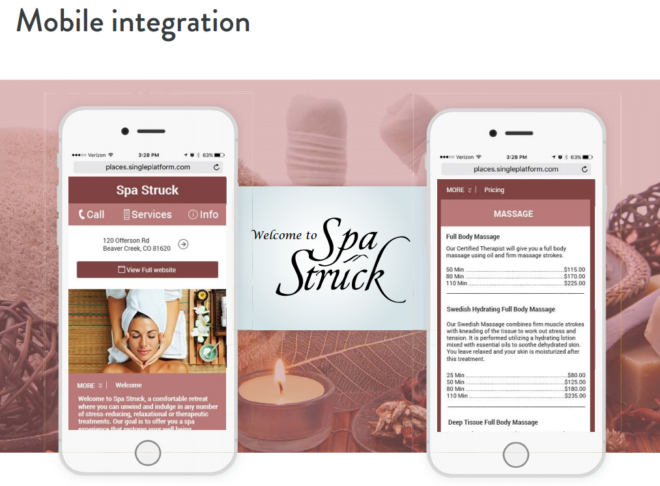 Full mobile integration. Your customers will view a mobile-optimized site when researching your services, and the experience will be seamless and clean regardless of what device/computer they search from. A personalized setup. 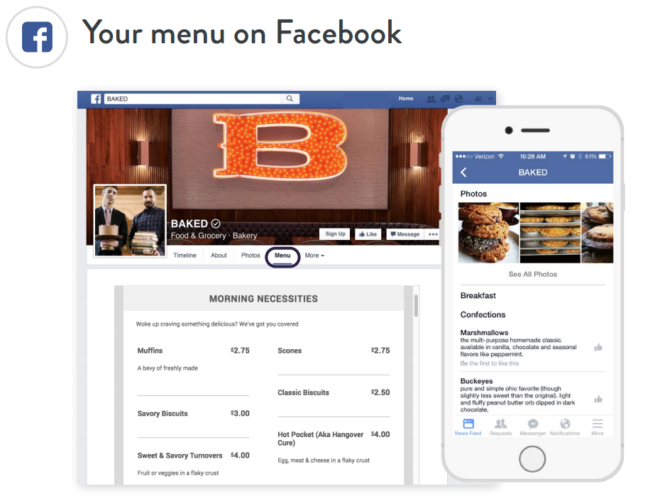 Retailers/restaurants can simply email a photo of their menu/services to the customer success team, and SinglePlatform takes care of inputting the rest! Do-it-yourself updates. Need to make quick changes? No problem. Quickly and simply login to edit your business listing, services, view analytics, and more. 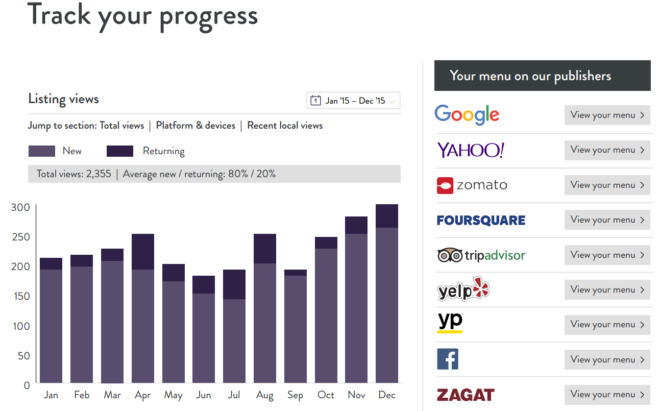 SinglePlatform lets you get granular with how your services/menu is displayed. Update specific prices, schedules, descriptions of services, and more. You can even choose which listings/offerings show up “first” for customers to view. Dedicated access to SinglePlatform’s customer success team. Have a question? Confused about how things work? Need help making an update? No problem – call and speak with a live human to get a quick fix. Click below to talk to a SinglePlatform representative!